Forgive Me, Bear! 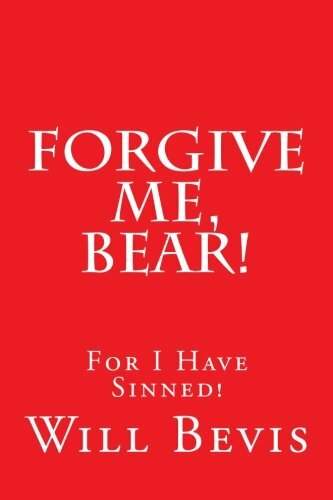 : An Open Letter to Coach Paul &#34;Bear&#34; Bryant Asking Forgiveness For My SIns. In Alabama, there is only one person greater than "The Bear." That's JC himself. And although the legend has now been dead thirty years this year, he still has tremendous power over people - even non-believers. Even when they're not awake. I was one of them. A non-believer. Until he straightened me out... In the strangest way. An Open Letter... A story sure to warm the hearts of Alabama Crimson Tide Fans... And to make a million enemies out of Auburn Tiger Fans. About the Author: Will Bevis is a prolific writer of short, sometimes very controversial "Slice of life" stories and memoirs that make you feel you are right there, experiencing the story as it it happens. His best known story is the Top One Hundred Free for Kindle story, "The Killing of Train-Man Brown." He has written over eighty short stories including, "Then Her Wig Fell Off," "Let the Dog Drive," "Blackbird," "Slow Foreplay on a Fast Bus," and many, many others. Many are available as audio books. Go to WillBevis.com for more details. About the Author: Will Bevis is a prolific writer of short, sometimes very controversial "Slice of life" stories and memoirs that make you feel you are right there, experiencing the story as it it happens. His best known story is the Top One Hundred Free for Kindle story, "The Killing of Train-Man Brown." He has written over eighty short stories including, "Then Her Wig Fell Off," "Let the Dog Drive," "Blackbird," "Slow Foreplay on a Fast Bus," and many, many others. Many are available as audio books. Go to WillBevis.com for more details.